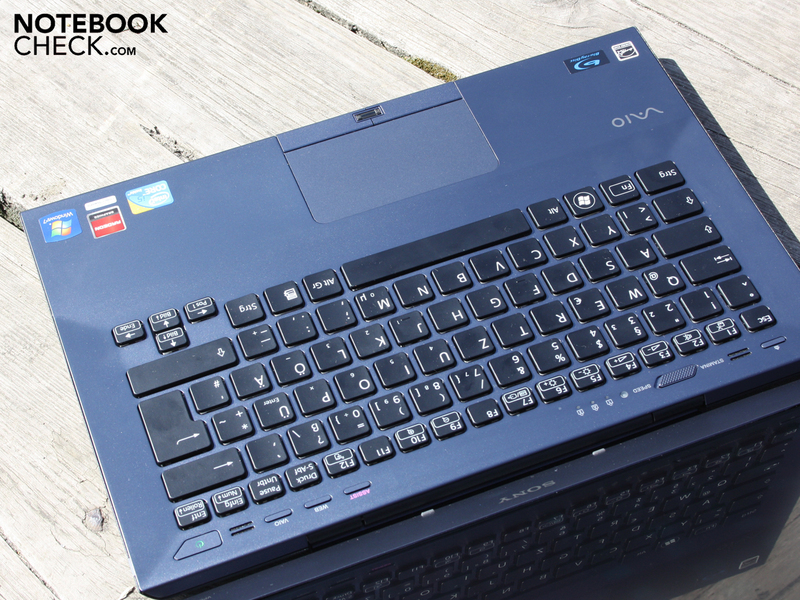 Sony's new mainstream laptop is supposed to be the Vaio SB range. We're not saying that to put the 13.3 incher into a pigeonhole. Sony says this itself. The seasoned reader immediately sees features that are actually business typical when scrutinizing the spec sheet. That would be a docking port for a Sony Vaio docking station and a connector for a battery slice. Can every consumer get the "Big Business" and Hollywood feeling? Is the 13.3 incher suitable as a versatile mobile companion? Will the battery life protrude in areas beyond four hours despite dedicated graphics and standard processor? Can the invisible cooling system do its job quietly but effectively in the slim chassis? Find all answers in this review. Note: The VPC-SB1Z9E/B at hand was a pre-series model. The CPU, Core i5-2520M, isn't available in (current) standard models, but mostly an i5-2410M (2x2.30 GHz), apart from the Core i7 version, VPC-SB1B9E/B, with an i7-2620M (2x2.70 GHz). At the end of the review, we were supplied with a white VPC-SB1S1E/W standard model with 2410M and found the ergonomic and constructional rates confirmed. No matter if white or black, the new SB models all present themselves in a matt and partly very slip-proof combination of plastic (interior, display bezel) and light magnesium (lid, case tray). The lid and case tray have been coated and thus the corners could sooner or later scratch if not handled with care. The lid is accentuated by a narrow, slip-proof strip of the same color on the front area. It provides for a good grip when opening. The DVD tray has the same surface. 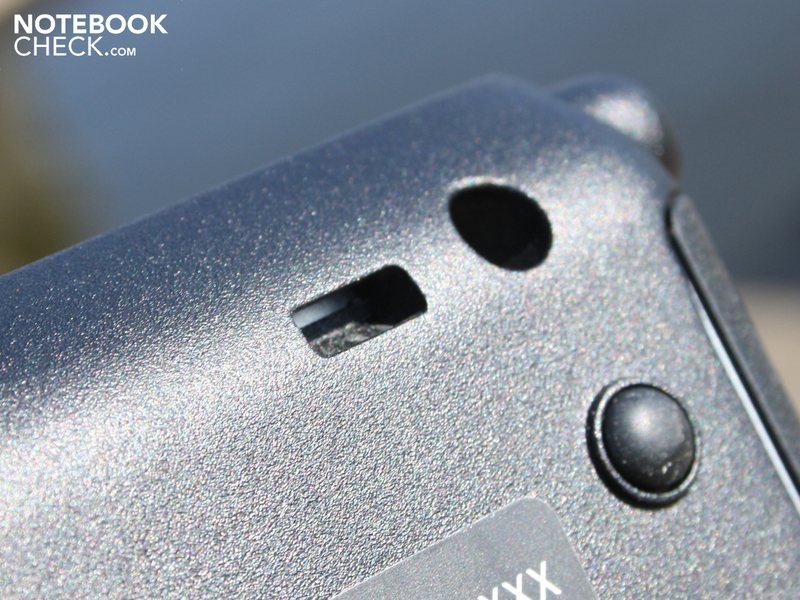 The silver plastic interior proves to be fingerprint resistant and has a fairly good grip. The work surface isn't as solid as a rock over its entire width while typing. We can dent the key field evidently with medium pressure. 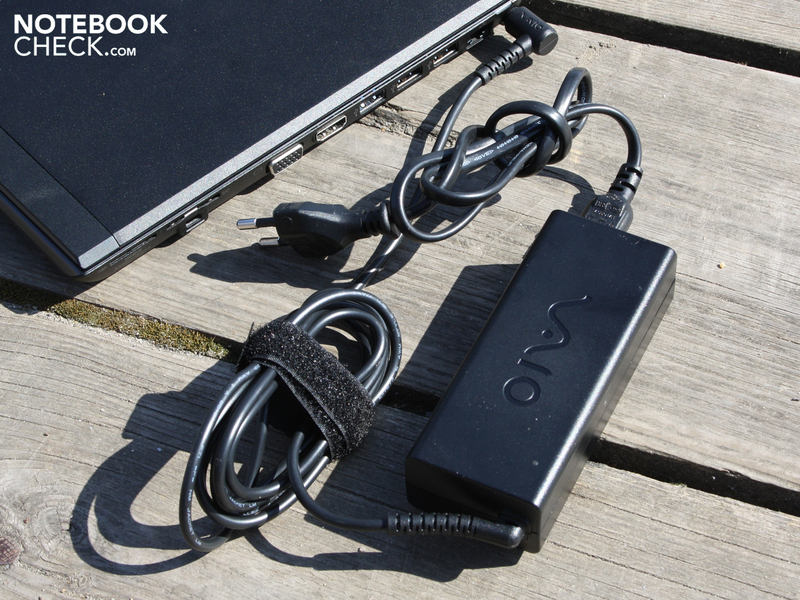 If you put value on a perfectly stiff base unit, you'll be disappointed by the Vaio SB. The area around the optical drive yields, respectively bends, obviously (standard model). In view of quality, leaving out the optical drive would definitely have been a good idea. It doesn't look much different with the lid, whereas it is a compromise of stability and grace due to its slimness. The hard magnesium lid surface weakens stronger bending or stronger denting. However, it can't prevent it. The centrally placed hinge looks like a very broad complete hinge. But that isn't the case. There are two hinges which are mounted fix on the chassis. 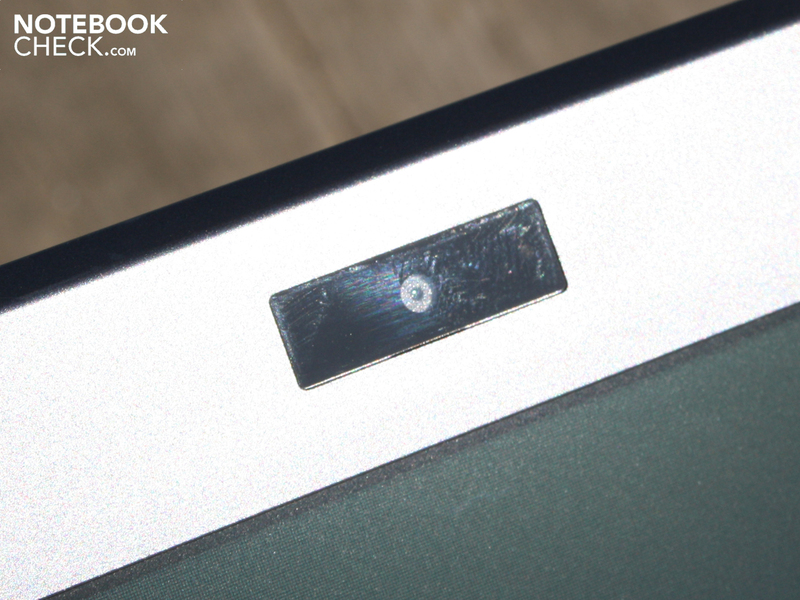 A silver and black plastic cover prevents seeing the metal hinge. The lid can be opened up to 140 degrees and has a spongy, pliable stop. This is the hinge's biggest drawback. It can't prevent the lid from permanently teetering when placed or during rougher trips by car. Almost all connections have been migrated to the case's right side. 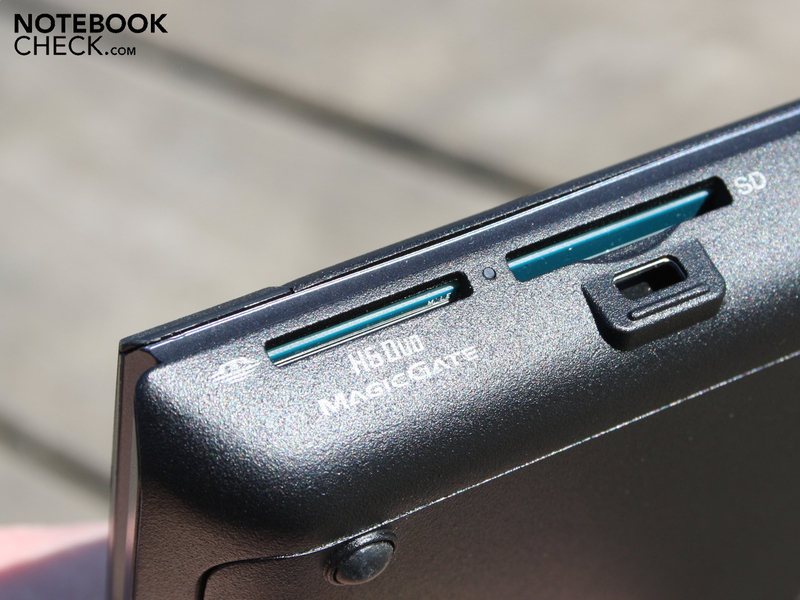 While no ports are on the front or rear, we find the headphone socket on the left. In return, three USB ports (one of them a USB 3.0), VGA, HDMI and Ethernet are gathered on the right. 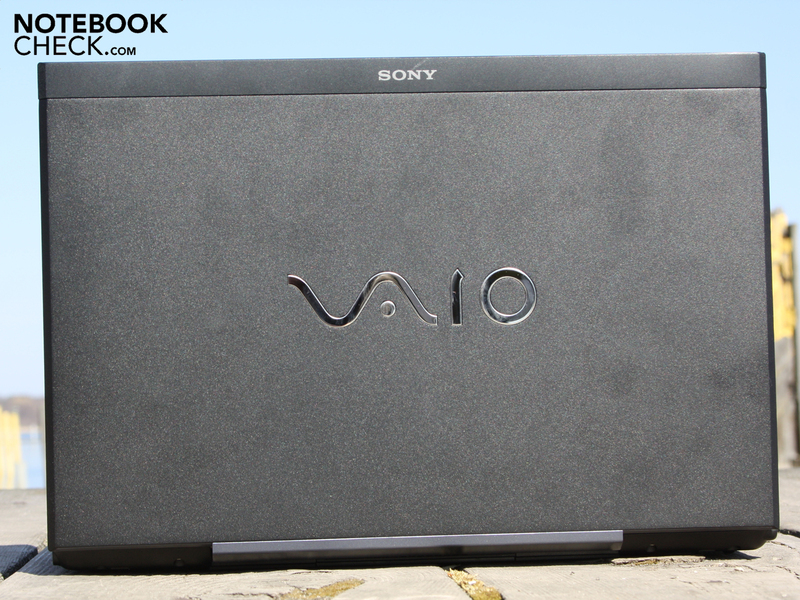 The dual cardreader, for a memory stick and SD cards, belongs to the Vaio notebook standard. The interface positioning allows an adequate cable run towards the right rear. The desk's left side is spared from a cable mess. But it's not optimal for right handed users. Due to the below mentioned docking option, this issue isn't as relevant as for laptops without a docking station. The way to the inner components isn't obstructed. 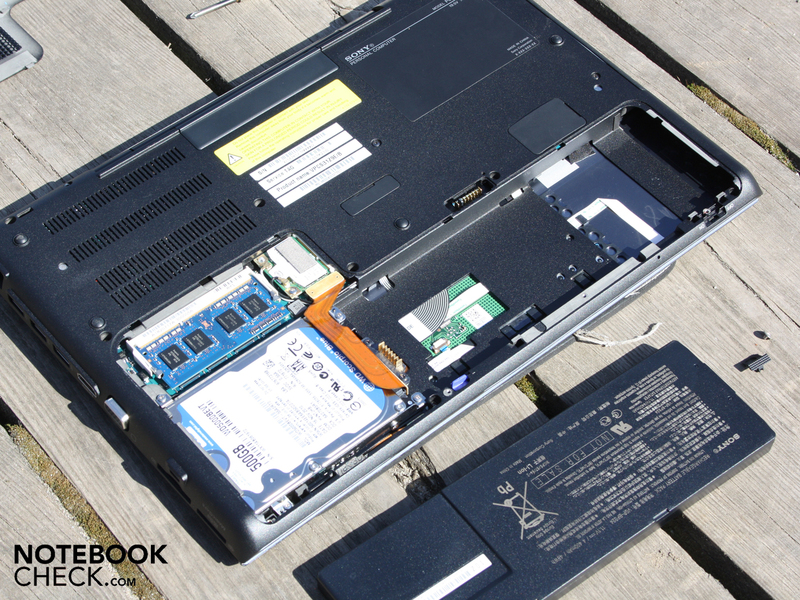 A cover secured by two screws reveals the battery, the HDD, the RAM (1 module) and the WLAN module. The battery can be removed and theoretically mains operation is possible without it. Wireless communication can be described as up to date: Gigabit LAN, draft n WLAN, Bluetooth 3.0 and a Qualcomm Gobi HSDPA module for mobile internet access. 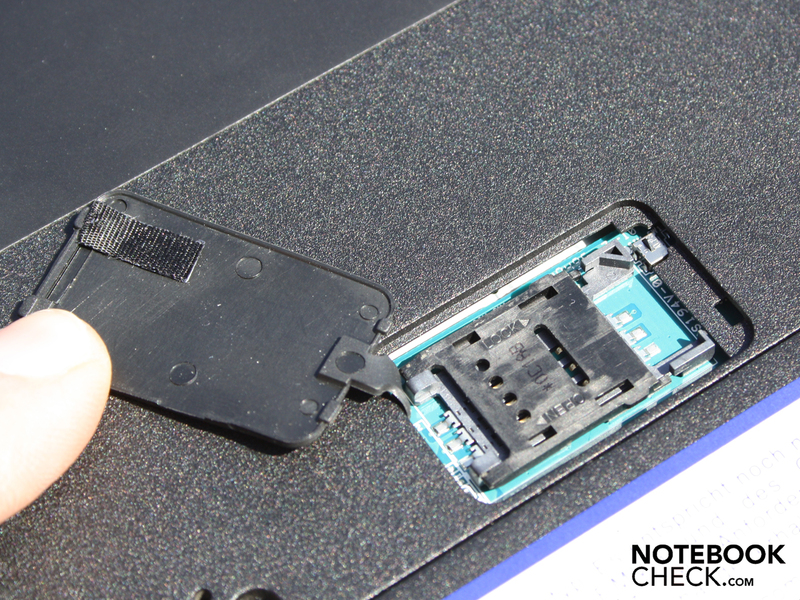 The SIM card for the latter is inserted underneath a hard rubber cap in the base plate. 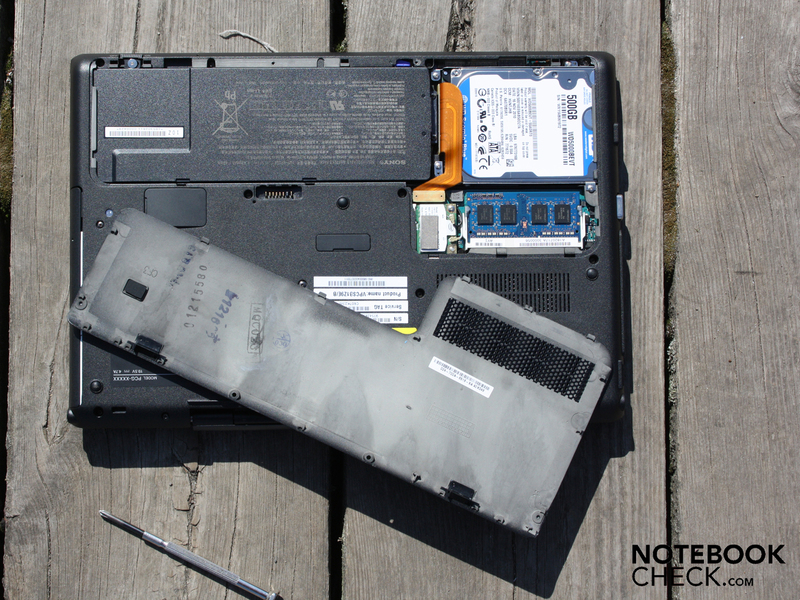 However, albeit it is faster to do than under the battery, there is a certain risk of removal when the Vaio is being used. The SIM card could be damaged in this case. 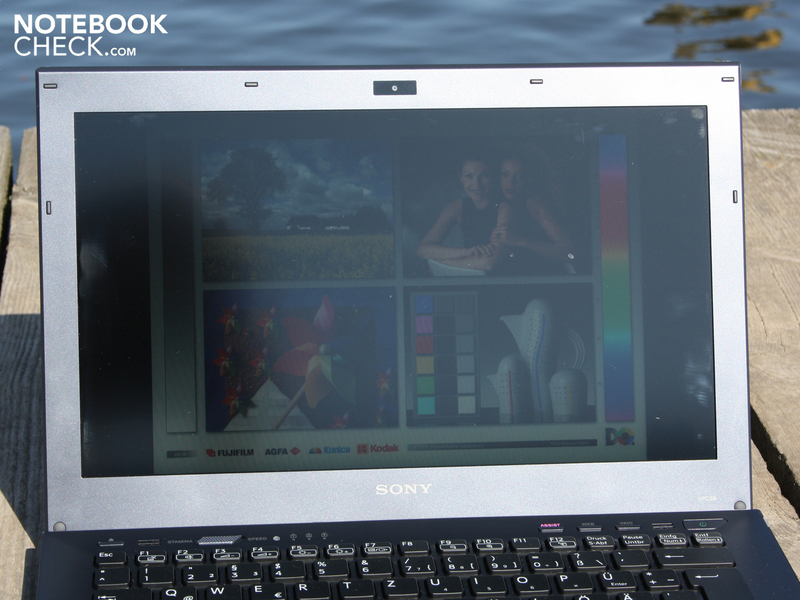 The 3G option is included in the Vaio SB starting at 1099 euros. You can't retrofit the module on your own. 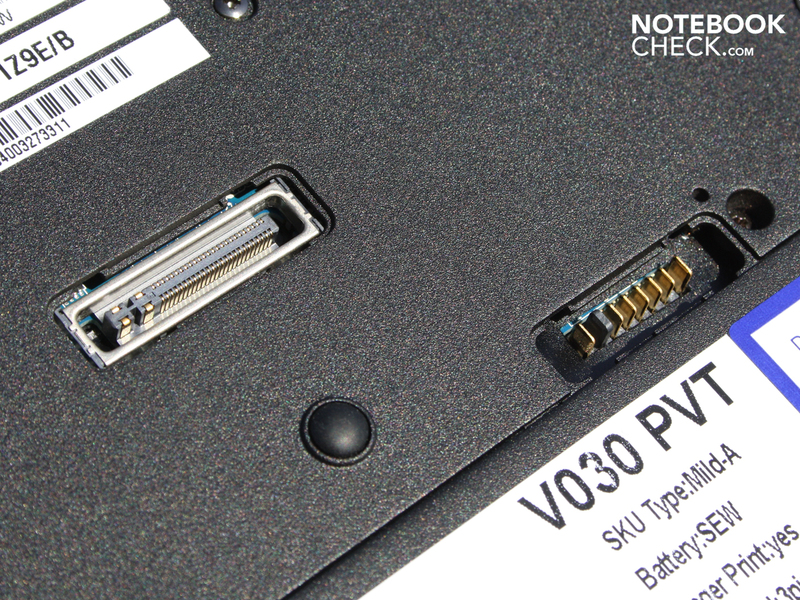 The non-3G entry level version, VPC-SB1S1E/W, doesn't have an opening for the SIM card slot. 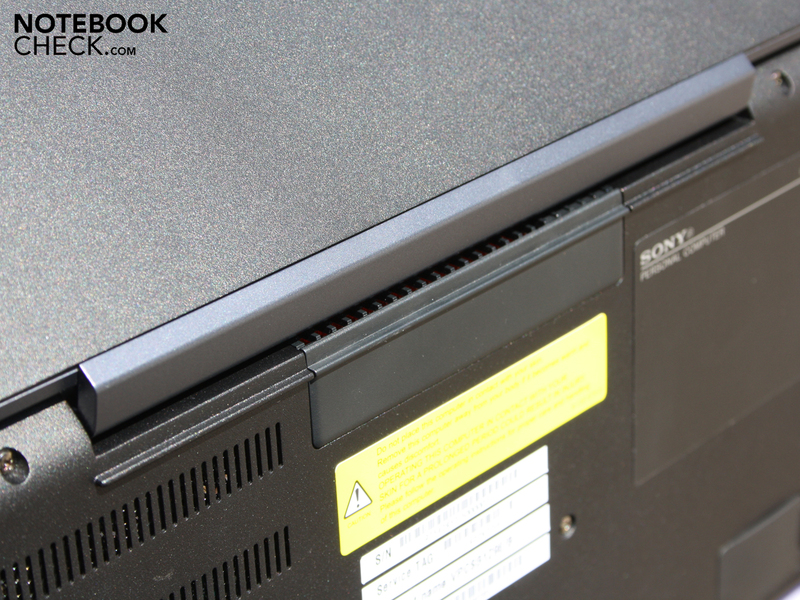 The security features don't go beyond a Kensington Lock and the option of a shock-resistant SSD disk. The docking solution, VGP-PRS20 (about 129 euros) has found its way into the mainstream category. It uses the same power adapter as the laptop, so mixing them up won't lead to power loss. In addition to HDMI, VGA and two RJ45s (LAN), it adds four USB ports. 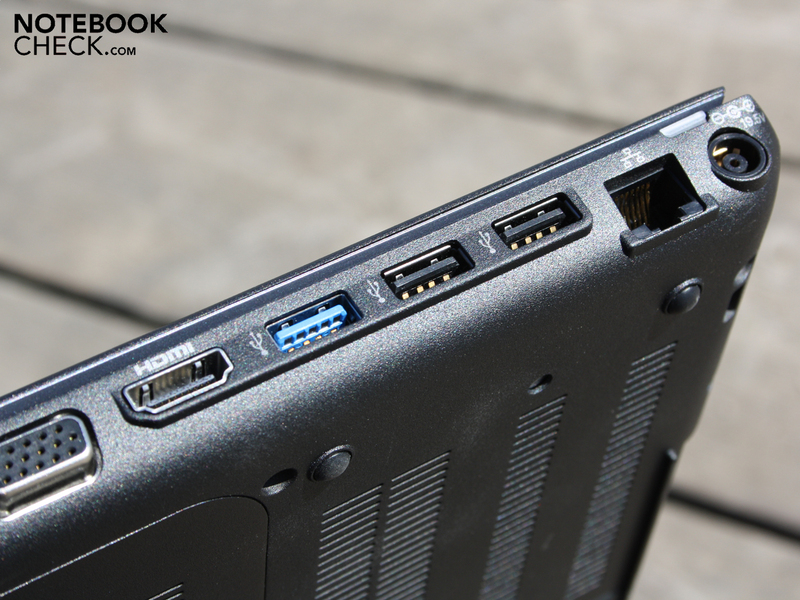 The laptop's HDMI, VGA & RJ45 can't be used as soon as the subnotebook is on the docking station. 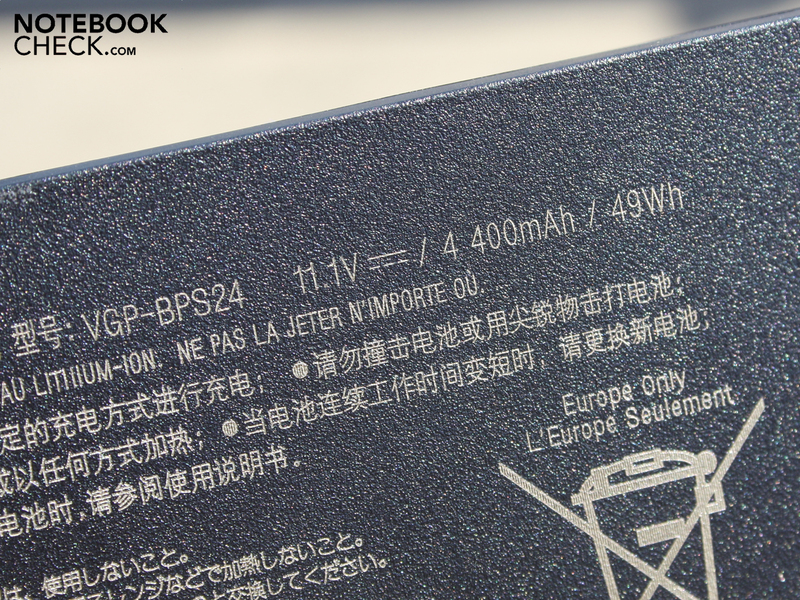 The battery slice, VGP-BPSC24 (lithium-polymer), costs 130 euros and is inserted securely underneath the chassis. The manufacturer warranty is granted for 24 months. This period, which deviates from Sony's 12 month standard, is only available for the customer when it's registered after purchase. 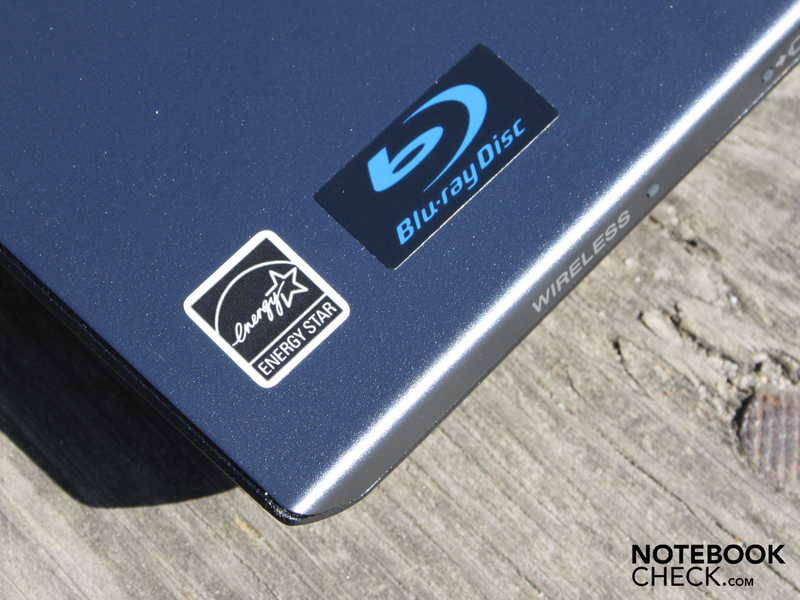 The according warranty extension (plus one year) is on a sticker on the device's package. If you require an onsite repair in case of damage, you can acquire the Service Pack, VGPE-VPPSL/3, with a validity of three years (270 euros). The keys have a distinct, large gap between them (almost four millimeters). 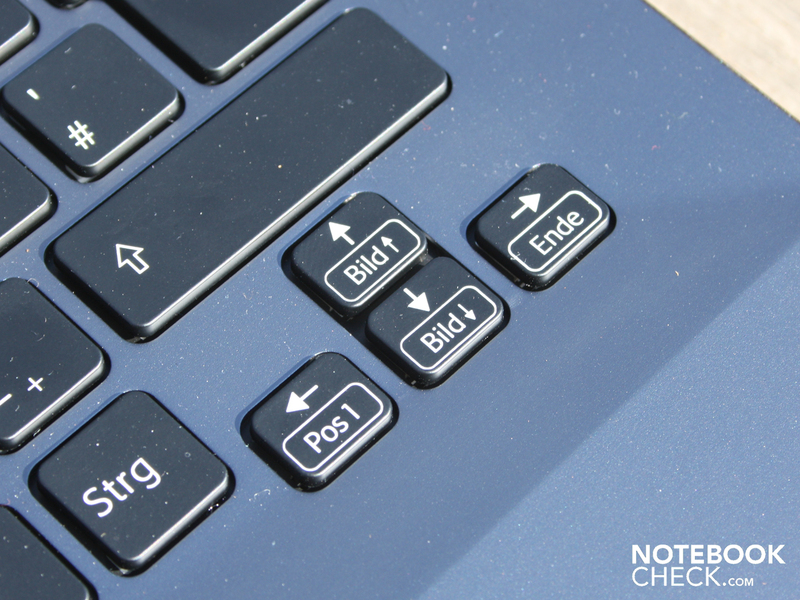 The "enter", "shift" and "backspace" keys can spread out and develop their full size. If required, the number pad can be placed on the letters with the Num key. The complete work surface is a homogeneous surface. The keys lie in a small basin. The clear pressure point and the medium key drop are good. Typing works right away and is accurate despite the even keys. 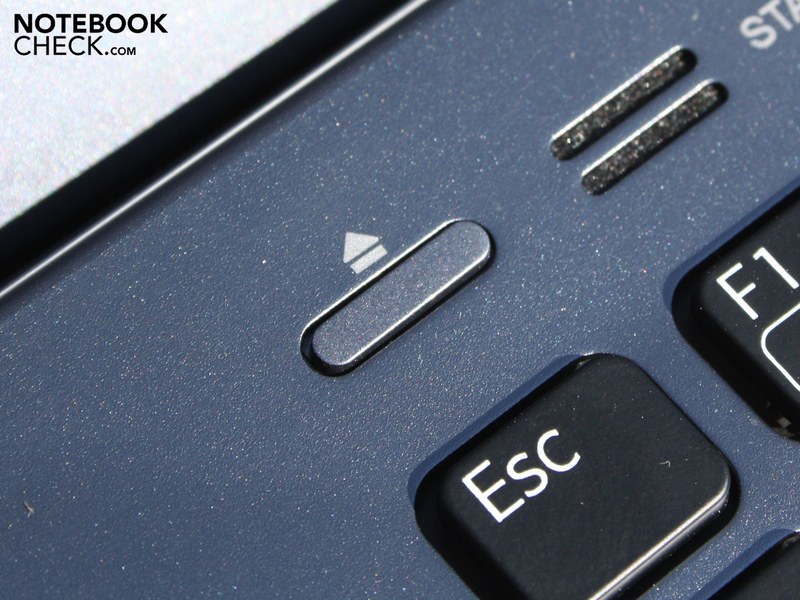 The key stroke is soft and very quiet on the entire surface. If you hit the keys hard, you'll notice that the surface yields a bit. This doesn't have an effect on the good feedback because typists will soon find out: You can deal best with this keyboard with a gentle typing technique. The keys would be perfect if they had a convex indentation. 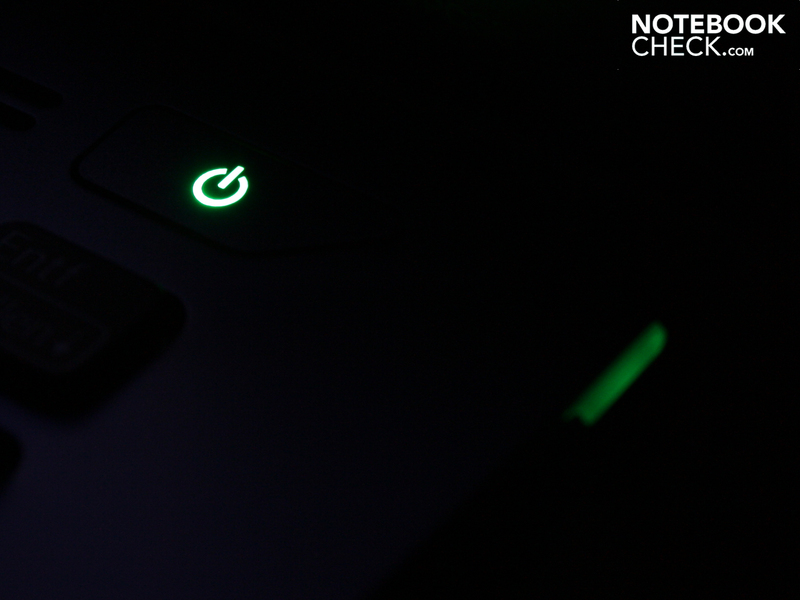 In return, the key's backlight is praiseworthy. The mouse pad has a diameter of 10.5 centimeters and is sensitive over its entire area. A few 15.6 inchers could take an example from the luxurious size. The matt surface has smooth gliding traits. 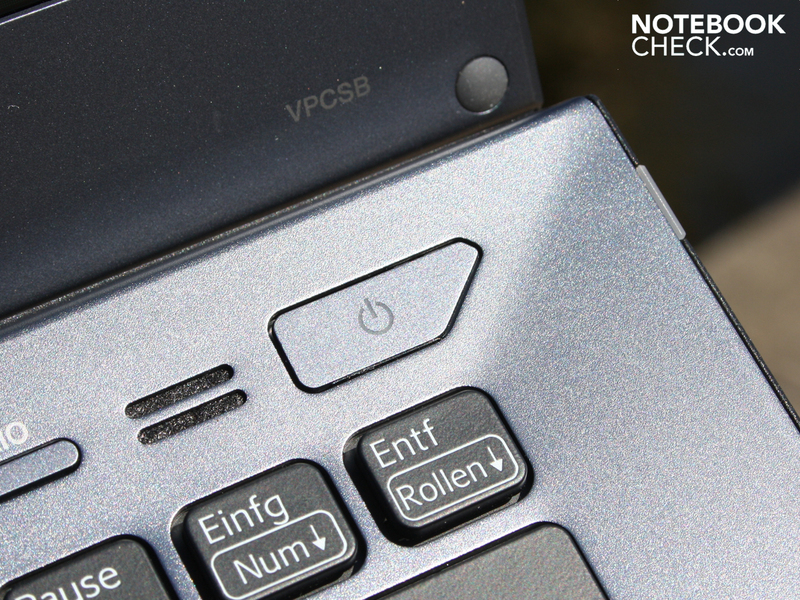 Horizontal and vertical scroll bars aren't marked on the Alps 7.1 multi-touchpad, but they exist. An extremely large touch surface is available when these fields are disabled. We find the key operation unsatisfying. The drop is very small and the pressure point (click noise) comes with delay depending on the position. 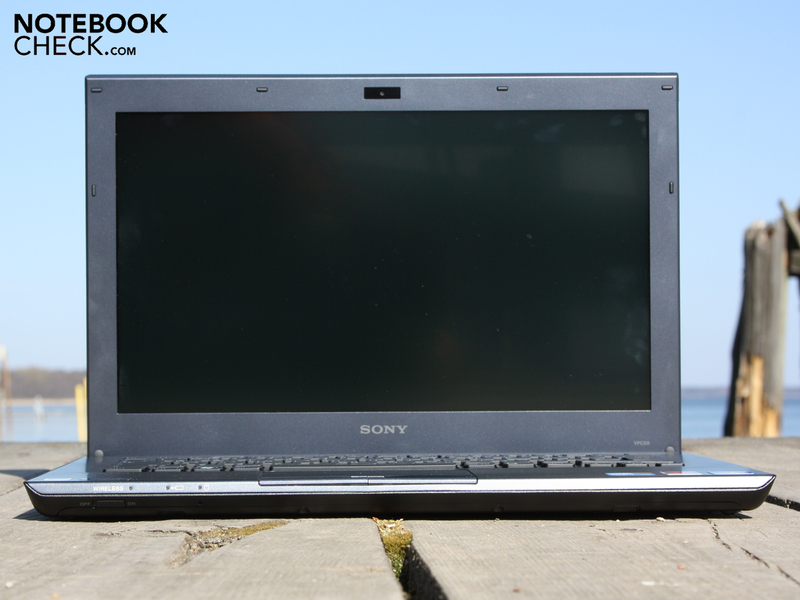 Sony's 13.3 inch screen standardly has a resolution of 1366x768 pixels (16:9). The highest priced SB models don't offer other resolutions or screens, either. 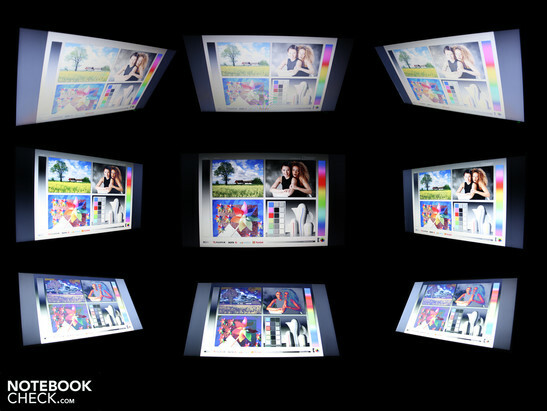 The screen, which has been given a gradient anti-reflective coat, can't convince us in terms of colors. The contrasts are low and the color spectrum is small. We determine a contrast of 138:1 with a weak black value of 1.85 cd/m2. Higher contrasts equal bright, fresh colors. Colors look pallid and bleached. The color spectrum can't even be called that as the measurement with the colorimeter, X-Rite i1Display, illustrates. AdobeRGB (t) and sRGB(t) are missed by lengths. 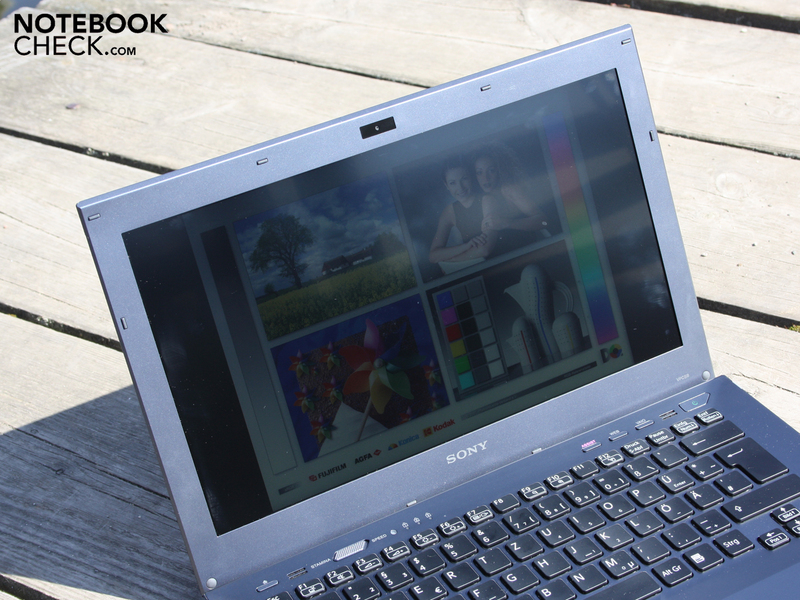 The high quality 15.6 inch consumer screen as in a Vaio EB4X (FHD) or even a Vaio F21E/B can reproduce a significantly larger color spectrum. The 13 inch laptop is quite impressive in terms of maximum brightness. We measure a good 250 cd/m2 in the highest setting on average. This is very close to the maximum of 257 cd/m2 because the LED back lit screen shines very evenly (95%). It's not reduced in battery mode. A light sensor adjusts the TFT's brightness according to the light conditions. That saves energy and is easy on the eyes. 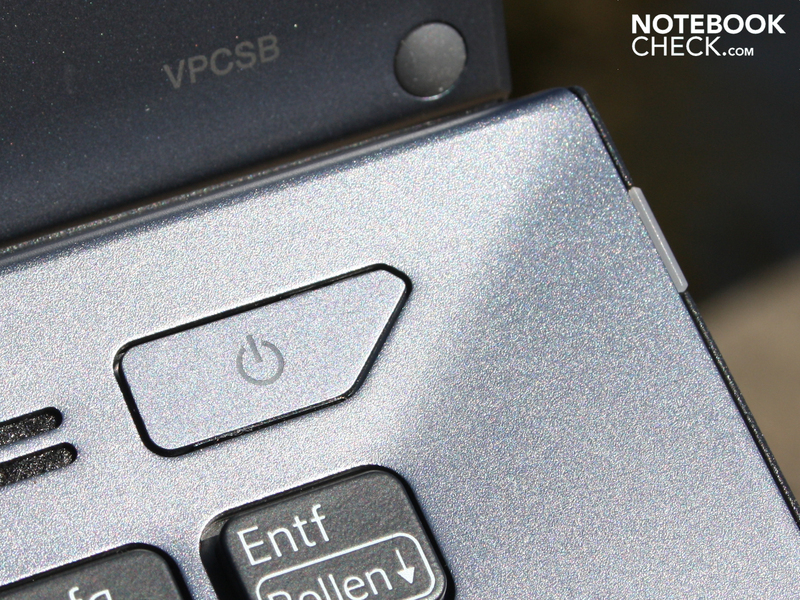 The sensor is disabled in the Vaio Control Center for the luminosity measurement. The brightness can't be turned higher when it's set to automatic. It can only be turned down via FN+F5. 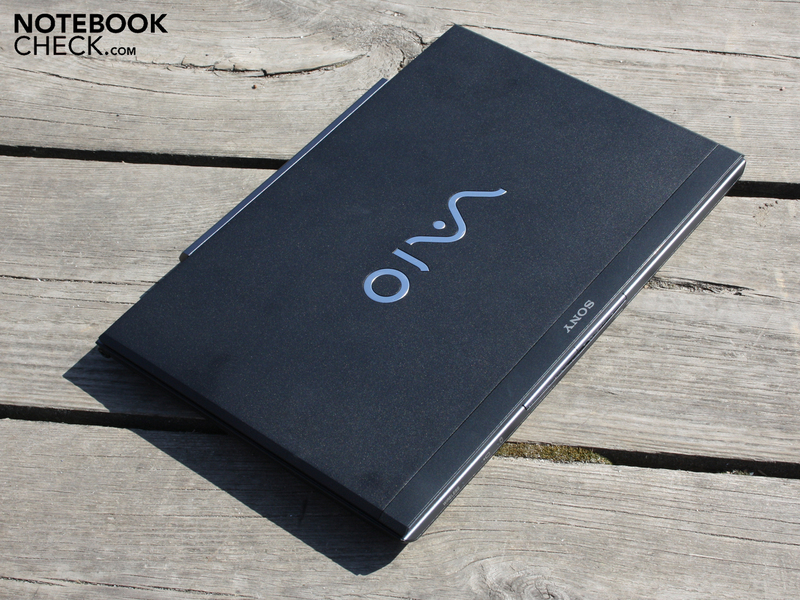 The 13.3 incher is well suitable for the sunny days of the year with its Vaio typical light AR coating. It doesn't completely prevent reflections (see pictures). A good outdoor suitability is given together with the good luminosity. The horizontal viewing angles are stable up to a deviation of about 45 degrees from the front position. The contrast massively decreases beyond that and colors invert. Script remains legible up to about 40 degrees when looking down (vertically). However, colors start to invert at 10 degrees (ghosting, color inverting). Thus, it is a viewing angle weak TN screen of the low cost kind. 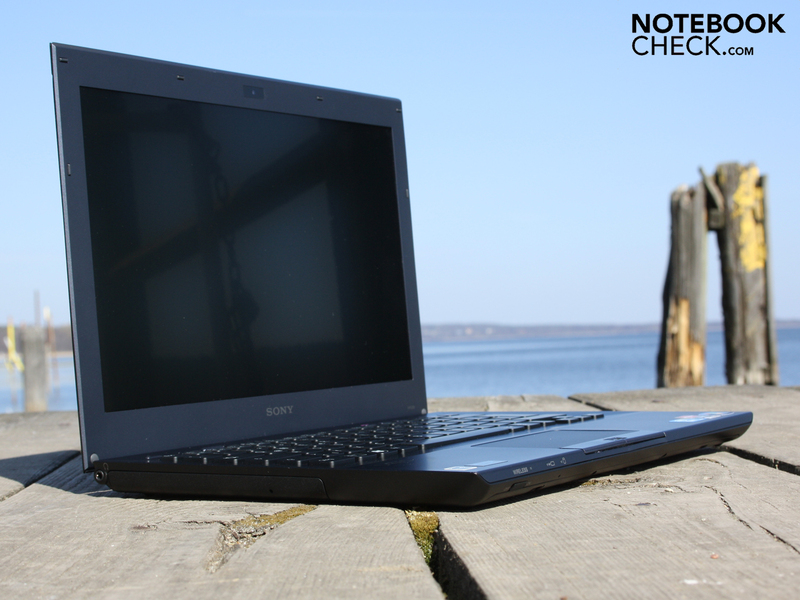 The Sandy Bridge CPU, Core i5-2520M (2x2.5 GHz) was part of our Vaio SB pre-series device. 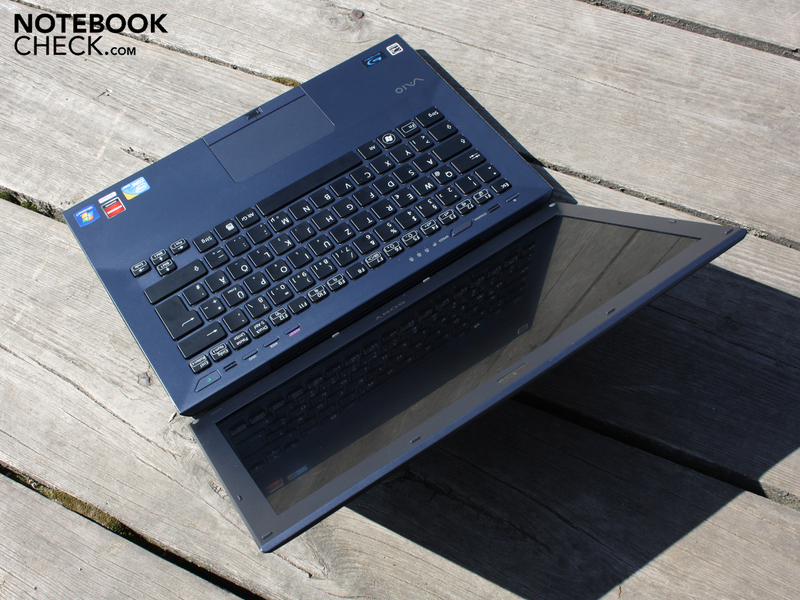 However, the SB is only found with the lower clocked i5-2410M (2x2.5 GHz) or the stronger i7-2620M (2x270 GHz) in shops. The turbo rate is 3.2 GHz and can also go beyond that as part of the Turbo 2.0 concept depending on the temperature. The 2011 Intel Cores can increase the turbo speed via “Dynamic Range @ Turbo Frequency Limits” providing that the cooling plays along (exceeding certain temperature limits). The graphics chip, HD Graphics 3000, in the processor (650-1300 MHz) is paired with an AMD Radeon HD 6470M (512MB). There is a Stamina/Speed button that allows you to choose the graphics card manually since Radeon just doesn't work with Nvidia Optimus. Technically, the switching is on a 2009 level due to interruptions of several seconds and flickering pictures. The standard RAM configuration is 4GB. Our pre-series test sample however was equipped with 6 GB. Four gigabytes are soldered, two gigabytes are inserted into the single RAM slot. The premium device, SB1A9E/B, is equipped with 8 GB. How fast does the i5-2520M (2.5 GHz, pre-series), or the 2410M (2.3 GHz, standard device) compute in comparison to the 2010 i5 generation? The 2520M achieves 4870 points and the 2410M 4482 points when calculating on one core (Cinebench R10 Single 64bit). A 2010 460M (2.53 GHz, turbo 2.8 GHz) is clearly defeated with 3939 points (e.g. Acer Aspire 3820TG, 13.3 inch). Single core processing is hardly important in routine work. If you encode videos with CyberLink's Power Director, you'll profit from multi threads with high clock rates. The i5-2520M (4 threads) achieves 10128 points (Cinebench R10 Multi 64bit). The smaller 2410M still reaches 9451 points. The 2010 i5-460M (4 threads) clearly loses: 8060 to 8342 points (e.g. Acer Aspire 5820TG). If you swear on performance, the Sandy Bridge CPUs will be just right. PCMark Vantage finishes with 7357 points. That is remarkable considering that most i5-460M systems achieved 6000 points until now (Acer Aspire 3820TG-5464G75nks), if they were also configured with a rotating HDD. The standard device, VPC-SB1S1E/W, only achieves 6187 points with its i5-2410M. The communication sub-score proves to have the biggest difference (9299 to 5990 points). The reason: The i5-2520M of our pre-series device has the business function, Intel VT-d, Trusted Execution Technology and AES Instructions. PCMark Vantage's HDD sub-score is 3380 points, which is a slightly above average result for a 5200 rpm HDD. Only a faster 7200 rpm hard disk can top that with about 3500 points. SSDs play in a completely different league (20 to 25 thousand points). The hard disk (500 GB) from Western Digital reads with 64 MB/s in sequential read. The standard device's rates are equal (same HDD model). Just alone the (512 MB) Radeon HD 6470M's nomenclature makes it obvious that the DirectX 11 GPU is an entry level card. The GPU clocks above AMD's specifications with 800/900 MHz (core/memory). Some application programs can exploit the 160 stream processors for calculating via DirectX 11, OpenGL 4.1, DirectCompute 11 or OpenCL. The UVD3 video decoder takes care of the hardware support in movie matters (MVC, DivX, xVid, MPEG-4 AVC/H.264, VC-1, MPEG-2, Adobe Flash Video). The gaming performance isn't the main issue of rating. 4615 3DMark06 are an indication for acceptable entry gaming though. 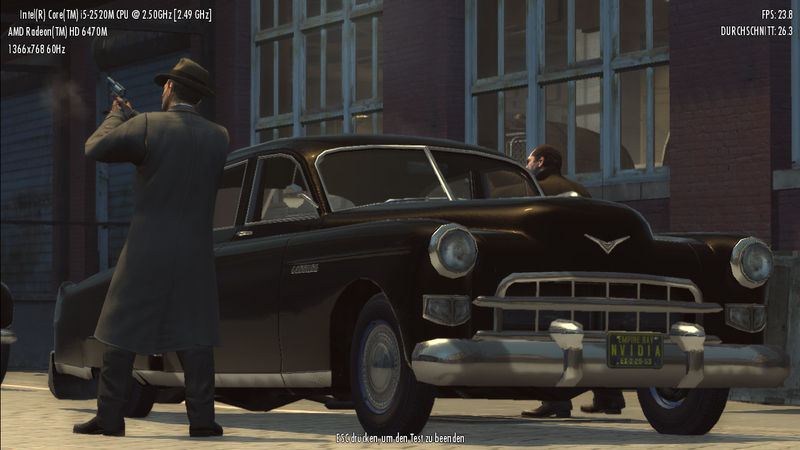 We have executed a random test with an older (Left4Dead) and a newer (Mafia2) game. The Radeon HD 6470M is good to go for a game of Mafia2 or StarCraft2. However, only in a coarse resolution and clearly reduced details. 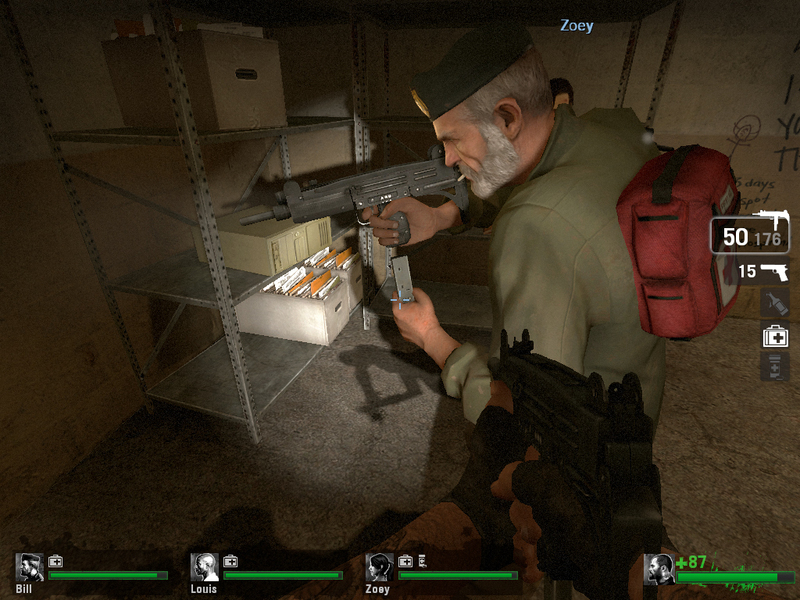 You'll find a smooth game play if you're into older or less demanding games such as Anno 1404, Left4Dead or Fifa 11. If you'd like more information you should look at the Raden HD 5470. 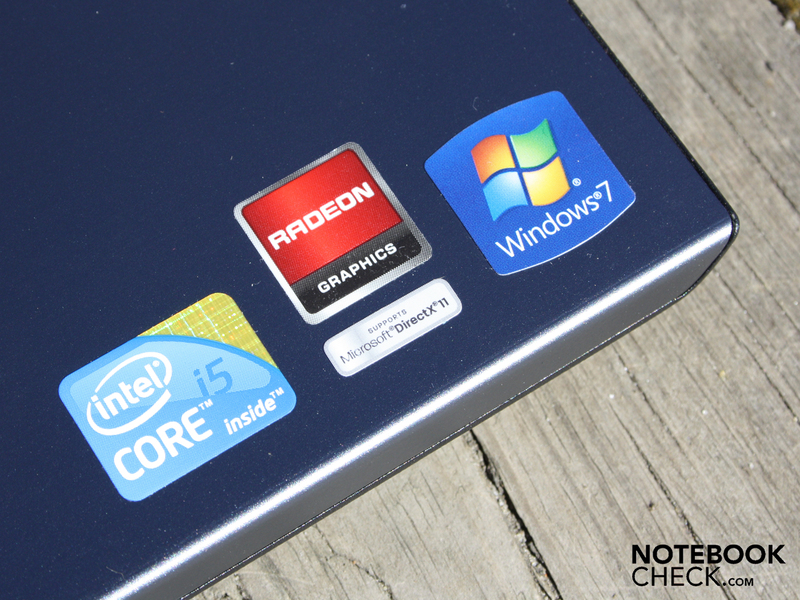 The 6470M is likely a bit above its performance due to the higher shader rate and the faster Sandy Bridge processor. 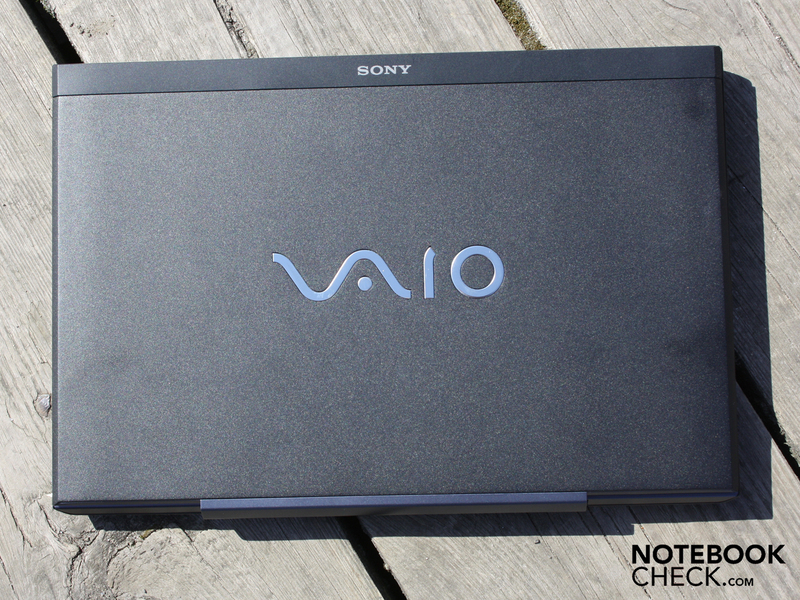 The Vaio SB makes an acceptable but not very good impression in terms of system noise. We can't confirm the fears of a few readers who expected the worst from the partly covered vent. 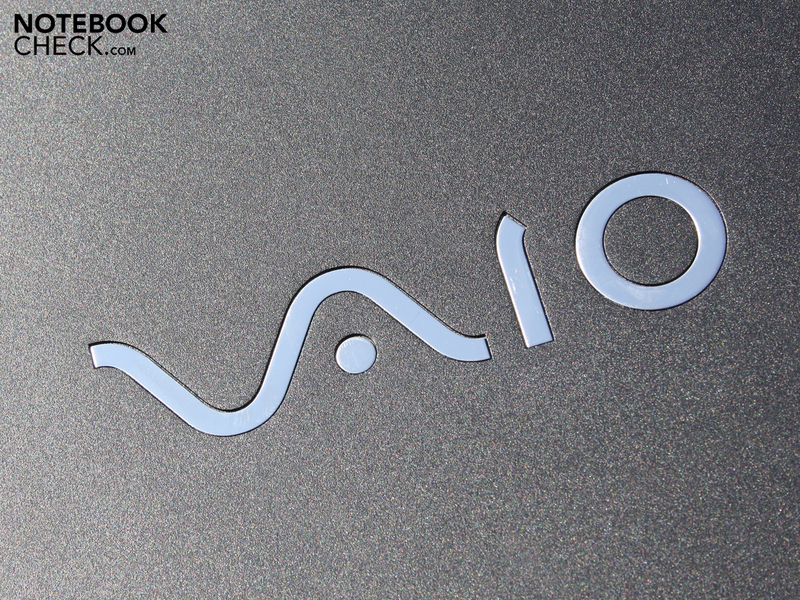 We executed the BIOS update, R1030H4 (BIOS update Vaio VPC-SB1). The pre-series device and the standard model react equally. 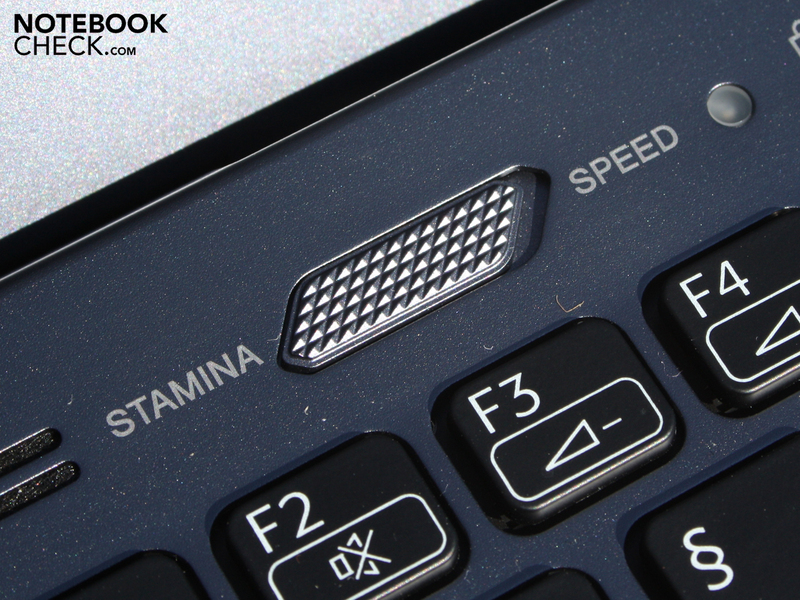 The Vaio SB is always audible in idle mode (Stamina mode), even when the fan temporarily turns itself off. Now the rotating hard disk causes a whirring base noise of 31.5 dB(A). When the fan starts up or changes its speed, it does so with a slow, constant acceleration. We quite liked the characteristic of slow increases and gentle decreases. But this doesn't hide the fact that the 13.3 incher makes quite a racket when the processor and/or Radeon graphics (Speed mode) are put under load. The high-pitched noise reaches the 40 dB(A) mark quite fast (3DMark Vantage, Cinebench R11.5). We determine 47.7 dB(A) in the stress test (CPU&GPU). At least the fan rotates evenly and rarely changes its speed. We hear a quiet, but rather fast decrease (20 seconds) at the end of the load phase. Since the fan is never constantly inactive, even in Stamina mode (HD 3000 enabled), waste heat doesn't accumulate in the chassis and everything remains in the blue field. Selective temperatures clearly increase during maximum stress over several hours. We measure 47 degrees Celsius in the vent's vicinity. That is however only a selective rate. The average is only 31.5 degrees Celsius. The processor's temperature sensors report up to 96 degrees during the stress test. The GPU only heated up to 85 degrees. The system remained stable during the test of several hours, but something prompted us to take a closer look. While the GPU didn't limit its 800/900 MHz clock rate in any scenario, the CPU experienced throttling (see screenshots). A CPU benchmark, such as WPrime or Prime95, causes a slight clock rate decrease of about 100 MHz. HWinfo marks the second core with a red "throttling". This is also the core that reaches the highest temperature with 96 degrees. Throttling doesn't turn up in Stamina mode during WPrime. The mini stereo loudspeakers above the keys supply an extremely treble-heavy sound. The volume is quite high, but no one will voluntarily turn up the shattering sound higher than 50%. The Dolby sound enhancements (Surround, Audio Enhancer) only have an effect with external loudspeakers. The 13.3 incher, with its 50 watt hour lithium polymer battery (4540 mAh), provides strong runtimes. It's good for five hours while surfing on the internet (via WLAN). 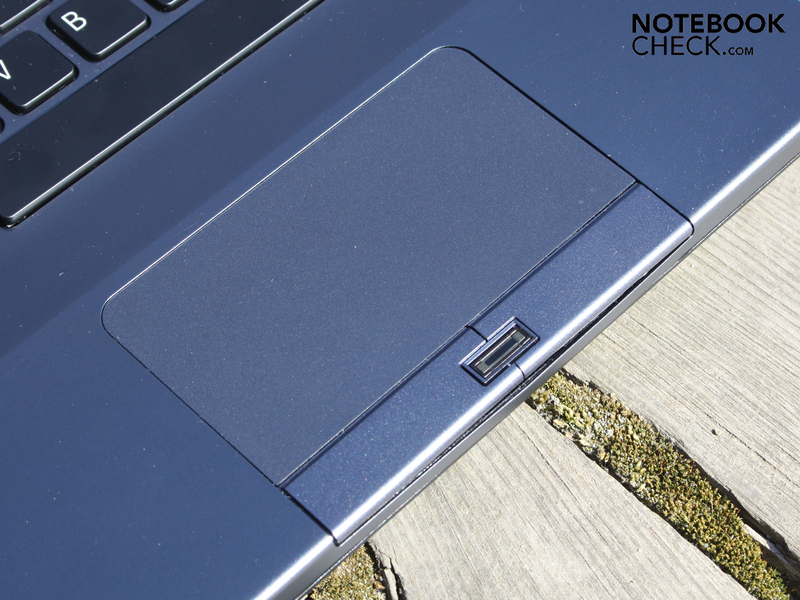 The battery life was measured in Stamina mode (Intel HD 3000) in a brightness of about 100 cd/m2. Our standard model, VPC-SB1S1E/W, with an i5-2410M, lasted for the same period in the WLAN test: 5:13 hours. 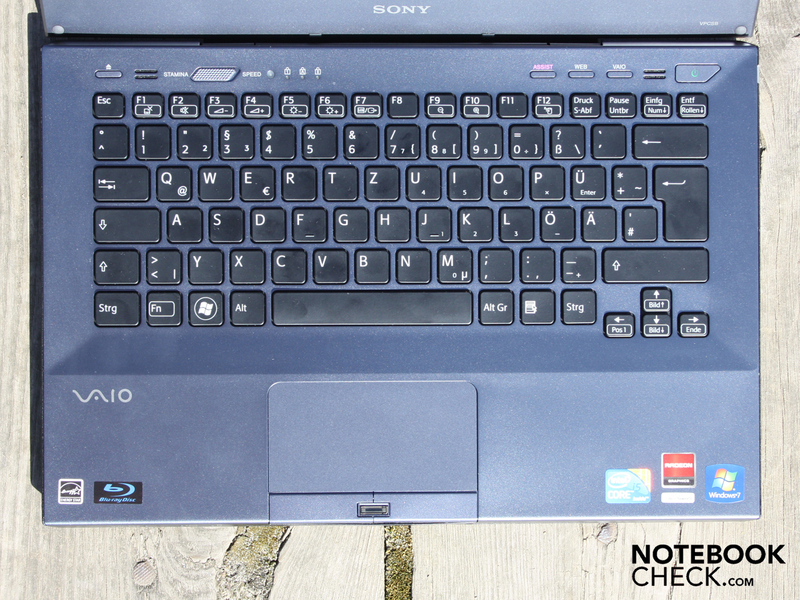 The Vaio SB can clearly last longer with reduced brightness and idle mode. The Reader's Test first ends after 8:40 hours (text reading in min. brightness). The hardware has more decoding work with a BluRay than with a DVD. Consequently, the runtime sinks to 3:57 hours (-21 minutes in comparison to DVD). Only 2:47 hours pass until the next movie session can start (charging time). The power consumption confirms a fact that is very typical for Sandy Bridge systems. A very large range is found between idle and high load (CPU/GPU). This is good because it shows that the adaptive power consumption (Turbo Boost) works. The idle power consumption ranges between 10 watts (Stamina mode, Intel HD, minimum brightness) and 19 watts (Speed mode, HD 6470, maximum brightness). Operation with load (Speed mode) is the exact opposite. 3DMark 2006 consumes 55 watts. It's even 66 watts in the stress test. 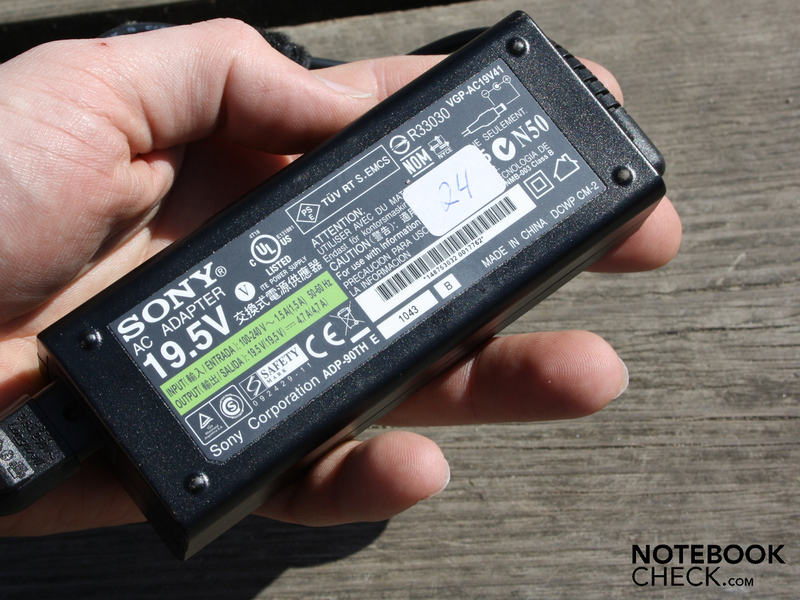 The compact 90 watt adapter (309 grams is perfectly designed for this and can even recharge the battery. The same power adapter model is used for the docking station. 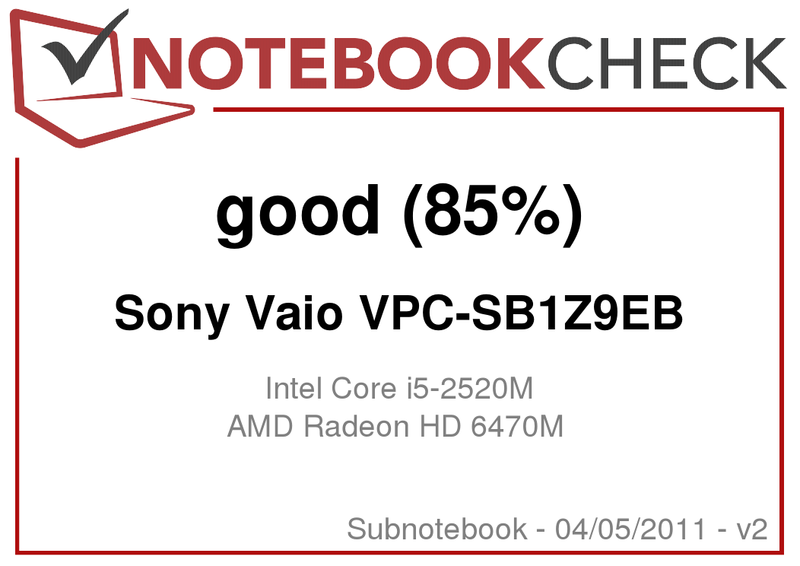 The Vaio VPC-SB1Z9EB earns itself a solid GOOD in the total rating with a healthy mix of business features, good workmanship and versatile performance. It reaches the best scores in the heavily processor driven application performance and the low weight. Our test device's Core i5-2520M (2.5-3.2 GHz) is (currently) not found in retail. Instead, a Core i5-2410M (2.3-2.9 GHz) is installed in SB models up to 1300 euros. The performance difference is lower than 10% (Cinebench R11.5, multi). Thus, the performance rating of this test device can generally be transferred onto standard models. The office use will like its Spartan looks. The 13 incher also looks smart in public with its low weight and slim build. Nevertheless, boasting doesn't impress the Apple community since the areas of the base plate, key surface and display hinge are too yielding. 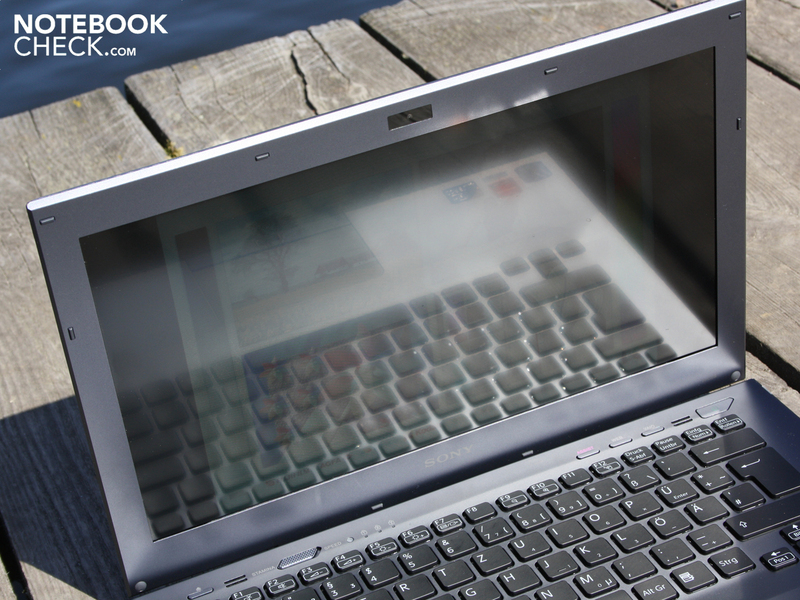 The touchpad and keys have a large, work suitable layout. The typing feel bids good feedback, but the mouse keys suffer of a weak key drop in return. In terms of mobility, the upcoming summer can be considered as saved with 5 hours of battery life and a bright, semi anti-reflective display. 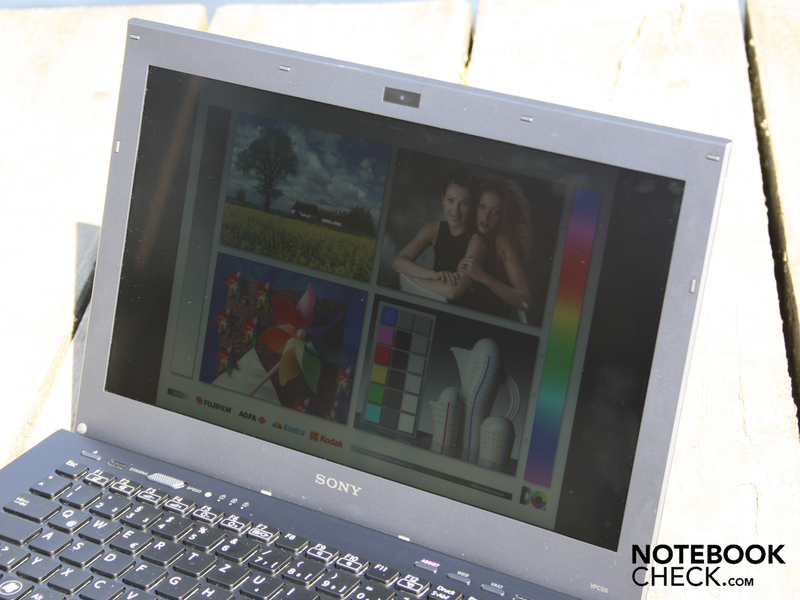 The latter is nevertheless not a high-quality, true color TFT as we experienced in the Vaio Z13. The extremely low contrast and pale colors won't lure any pro DSE worker from the woodwork. A novelty is the docking station and the battery slice option in this price range (starting at 999 euros). The SB range has practically inherited the switchable graphics from the Z13 (no 3-way switch any longer). The manual AMD Radeon deactivation can't hold a candle to the comfort supplied by the automatic Nvidia Optimus switching, which bids the same energy savings effect. The webcam regrettably only has a resolution of 640x480 pixels. or the power button have a restrained design. The power on lights up moderately bright. 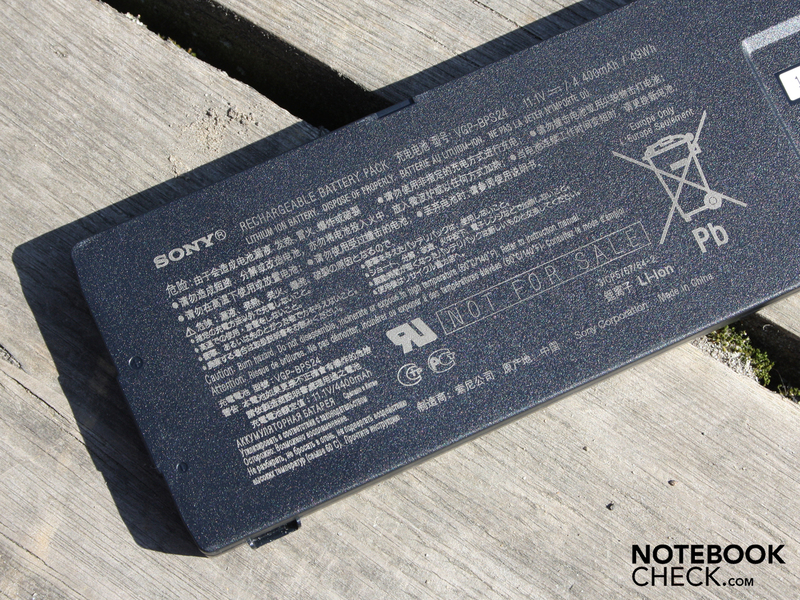 The battery is found inside the case. Its capacity of 50 watt hours suffices for about 5 hours of mobile surfing. The battery unit, alike the 2.5 inch HDD and the RAM can be replaced. be connected to the docking station. 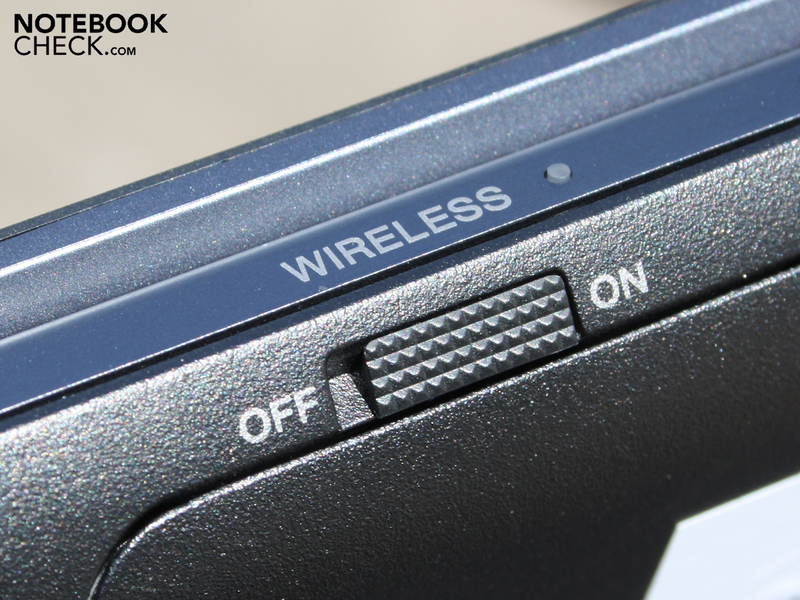 The wireless switch on the front has proven its value for fast deactivation on the plane. but the interfaces are limited to the most necessary (incl. USB 3.0). and clearly arranged input devices. and a manually deactivatable 6000 range AMD Radeon graphics do their job inside. 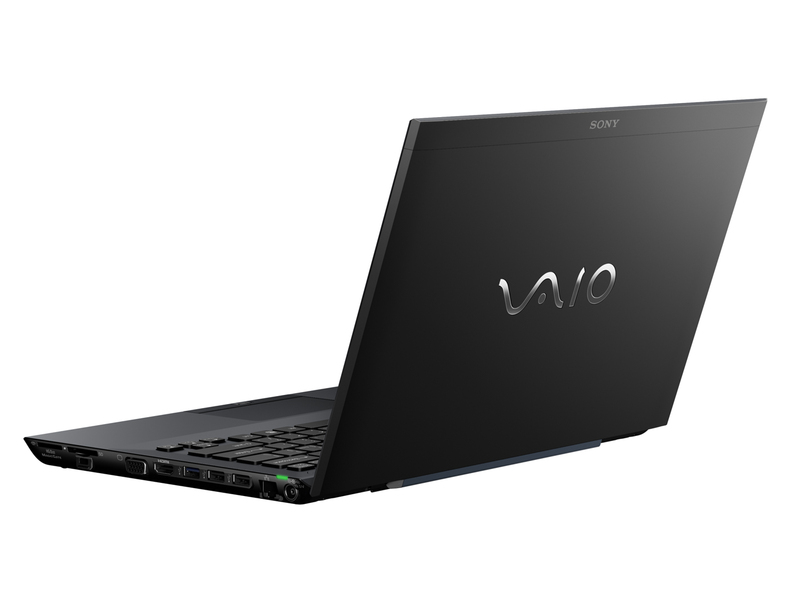 Vaio VPC-SB1Z9E/B, for currently 1250 euros. The 13.3 incher has a normal weight for its category with 1741 grams. The semi AR coated TFT screen with an LED backlight shines appropriately bright. Docking and battery feature outside the mega-expensive high-end Z13 series. A crisper typing feel for writing and pressing the mouse keys. The optical drive is in the way of a bigger cooling system. A better stability of the base unit. Heat development and the partly covered vent let some readers fear the worst. But apart from the maximum noise, heat and racket remained acceptable.